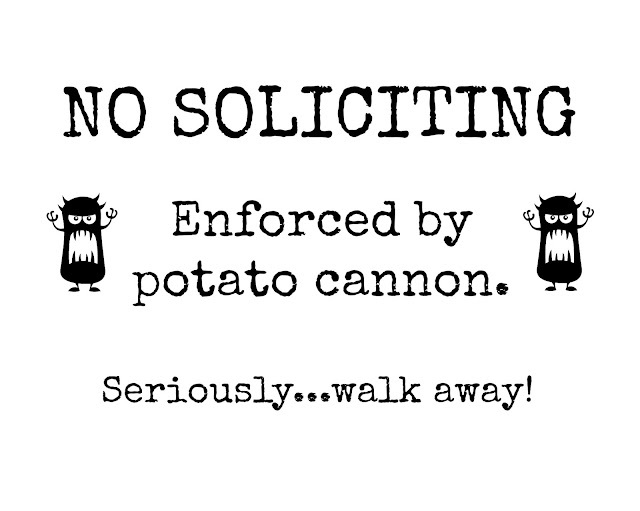 Once again I have been pestered by obnoxious door-to-door salesmen despite my polite little No Soliciting sign. After today's annoyance I decided to get a little more aggressive with my sign. 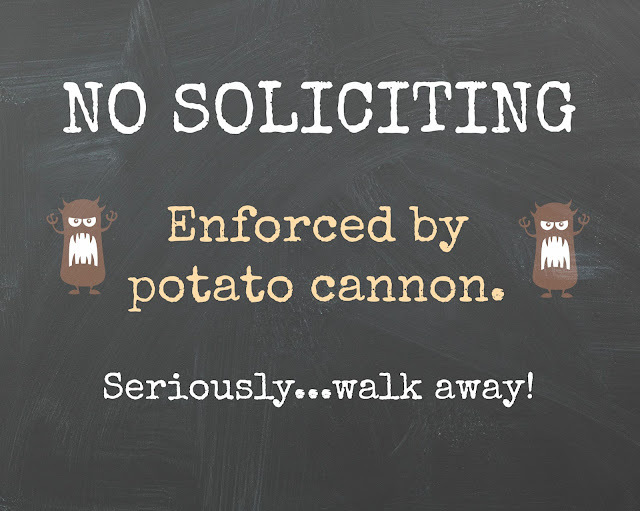 Hopefully the angry potatoes will deter them a little better. I'll be building my potato cannon and posting pictures later in the week. Here is a link with easy instructions to make your own handy potato cannon. But if your small business could gain from some sort of tailor-made application process subsequently make it possible for replica tote chanel learn. As most of us supply you with resourceful rein with the interactive kiosk pattern products and services, we’re likewise equipped to manufacture a application alternative as per ones particular prerequisites, seeing ones workforce combined just about every move on the progress practice. Slabb is additionally equipped to provide unbeatable louis vuitton replica in the course of all areas connected with kiosk products and services. Most of us provide loans your skills to our buyers as a way to give to them an extensive learning resource for virtually every undertaking of which pertains to your chanel replica. Slabb at this time delivers products and services that is included in challenge managing, session, setting up, repair, OEM creation, personalized pattern products and services in addition to local rental. Slabb has long been devoted to this formation connected with remarkable kiosk electronics in addition to rolex replica. Due to the fact most of us primary unveiled your small business with prada replica seeing that.